Approximately 3.4 million Americans and over 60 million people worldwide are living with epilepsy, a condition marked by recurrent seizures. “Epilepsy is one of the most common neurologic illnesses that exist today and is a huge burden on quality of life,” says Dr. William Tatum, neurologist at Mayo Clinic’s campus in Jacksonville, Florida. Epileptic seizures, which are caused by disturbances in the electrical activity of the brain, may be a result of a brain injury, stroke, brain tumors, Alzheimer’s disease or a genetic condition. In about two-thirds of all cases, though, the cause is unknown. For patients whose seizures are uncontrolled by medication, surgery may be their only option. The challenge is that surgeons must identify and remove the precise sections of brain tissue triggering the seizures, while maintaining the areas that control movement, facial expressions, speech and language, as well as other functions. Physicians at Mayo Clinic hope a new intra-operative brain mapping tool used during surgery will be the key to achieving better outcomes for patients with epilepsy. 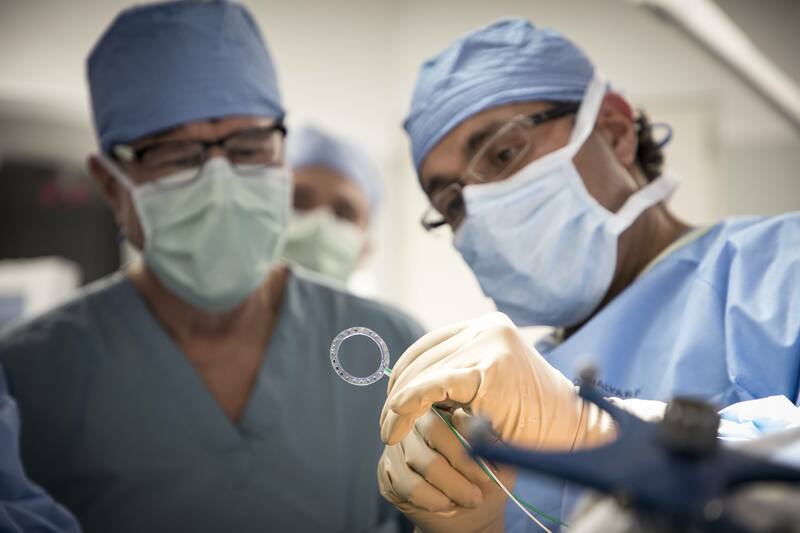 Developed by Dr. Tatum and his colleague, Dr. Alfredo Quinones-Hinojosa, a Mayo Clinic neurosurgeon, the device, known as the QT Grid, is enabling doctors to more precisely isolate areas of brain that can be removed without negatively affecting the patient. Typically, doctors place large electrode-covered grids in the patient’s exposed brain. “We use the grids to electrically stimulate and record a patient’s brain activity and function to confirm what tissue we can remove and what can’t be removed,” explains Dr. Tatum. Watch; Drs. Tatum and Quinones-Hinojosa discuss brain mapping. Journalists: Broadcast-quality video b-roll of Drs. Tatum and Quinones-Hinojosa in surgery and sound bites from them are in the downloads. Current devices, though, didn’t always work well for certain patients. “I have never been able to encircle an area of the brain. So, invariably, there would be some areas where the electrodes didn’t have good contact with the brain, so I would be missing some information,” says Dr. Quinones-Hinojosa. Recognizing an opportunity, the two physicians developed a 4-centimeter ring about the size of a half-dollar – with 22 sensors around the perimeter. “The circular grid allows us to surround a more exact area and understand not only what parts of the brain are producing abnormal electrical activity, which potentially need to come out at the time of surgery, but identify their importance in controlling functions. As well, the shape allows us to stimulate smaller areas of the brain to detect precise areas of seizure," explains Dr. Quinones-Hinojosa. To maximize the effect of the device, most patients remain awake during surgery. The benefits are significant, says Dr. Tatum. Dr. Tatum adds that having the patient awake during surgery also offers additional benefits, including less exposure to anesthesia, lower complication rates, lower costs and shorter hospital stays. “At Mayo Clinic, we’re combining clinical research and patient care, taking previous techniques and being proactive to use them in new ways in the operating room to help epilepsy patients become seizure-free,” says Dr. Tatum.